David Dillman and Monie Schlarb walk through the open space behind Riverview Elementary School. Neighbors are concerned construction of a home adjacent to the open space could disturb the entire hillside. 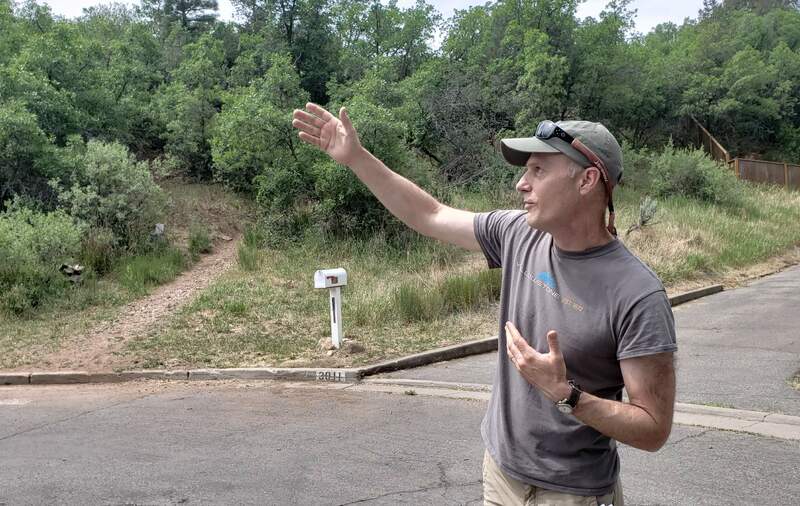 David Dillman talks about open space behind Riverview Elementary School, which is home to diverse plant life including mature Ponderosa pines, scrub oak and prickly pear cactus. Neighbors are concerned construction of a home adjacent to the open space could disturb the entire hillside. Riverview-area residents are concerned a proposed house will disturb a steep hillside at the end of East Seventh Avenue. The home could be built on private property adjacent to well-traveled open space behind Riverview Elementary School. 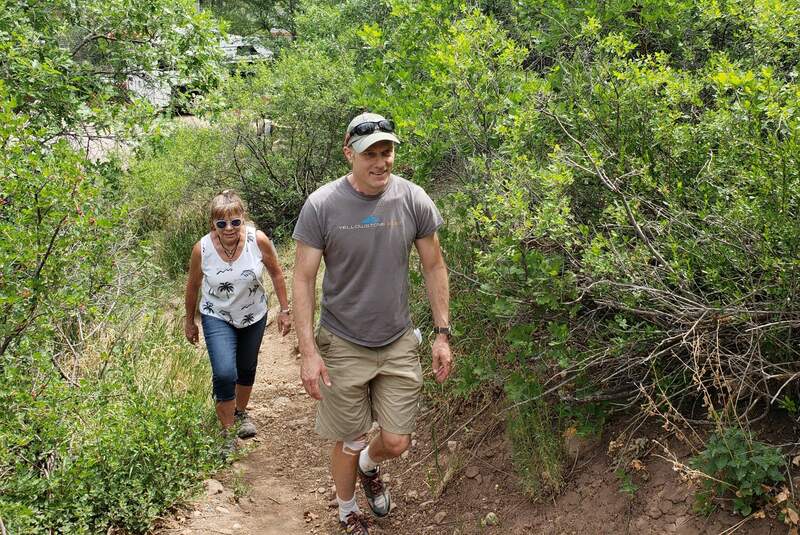 The undeveloped hill, known in the neighborhood as the Enchanted Forest, is home to several trails, diverse plant life and a wide variety of migratory birds, said Dave Dillman, who lives nearby. Neighbors are worried the construction of a home on a 5,227-square-foot lot will lead to erosion across the entire area, disturbing large Ponderosa pines and radically changing the area. “The integrity of the hillside – it takes decades, centuries before it comes back,” Dillman said. Neighbors recently launched a campaign to protect the Enchanted Forest, and they have collected 50 signatures in support of the hillside. It has been mostly a static campaign, with small signs near the open space informing residents of the construction, Dillman said. Neighbors plan to ask the city’s Natural Lands Preservation Advisory Board on Monday to reconsider purchasing the property and preserving it as open space. While the sale of the property is pending, neighbors want the city to be ready to purchase the property if a sale falls through, Dillman said. The property is under contract, but the sale depends on whether the city will approve construction on the site, said Marcy Pryor, the real estate agent selling the property. The property was listed for $81,000. The city cannot prohibit construction on the lot, said Scott Shine, city planning manager. But city staff will have to evaluate how the hill will be stabilized. Construction plans must also address drainage to ensure that water will not run onto any adjacent private property. “It’s a very difficult site to fit a home on, but if someone comes in with plans, we are obligated to review them,” Shine said. Neighbors understand that it’s difficult to find housing in Durango, and they bear the potential future property owners no ill will, Dillman said. “We don’t have any malice toward them at all,” Dillman said. But they want to make sure the trails in the area stay intact for everyone, including children on their way to school. They also want to preserve the area as a habitat for birds and as a gathering area for neighborhood kids. “I am real partial to it. ... The kids are building forts up there where my kids built forts,” said Monie Schlarb, who lives nearby. Efforts to preserve the property have been going on for a while. Dillman wrote the current property owner a letter asking him to consider placing the property under a conservation easement. He also asked the city Natural Lands Preservation Advisory Board in 2016 to consider purchasing the property as open space, but the board decided against it, he said. The board did not support purchasing the property because of its limited value to the overall open space system and program, Assistant City Manager Kevin Hall said.